We got the paddock right behind the house split into two today. 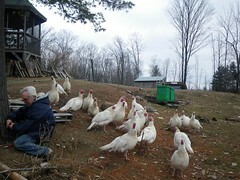 (Everything we do, no matter what, we have lots of turkey helpers!) This way the sheepies and Danny can have two sheds for the winter and we can water them with a hose run out from the basement into a heated trough. All of the birds can have the other paddock and sheds (also two) and I won’t have to deal with having grain around the sheeps. They go crazy insane looking for ways to get to the grain. George used to just repeatedly bash at a fence post until he’d knock it over if he could see grain on the other side. He’d didn’t have anything better to do, after all, and it would eventually work. This way the grain is all the way on the other side, a hundred feet away, and inside a shed. Hopefully this will work. I’m a little concerned about the fence we put it, though. It looks good but the bottom is a little looser than I’d like, and if they really test it, they’ll be able to push under. I’m hoping it snows soon so it’ll freeze to the ground, and then in the spring, if I need to, I can run some logs along the bottom and staple to that. We have a couple of possible ways to get the big round bales of baylage into the sheep paddock. Neither is perfect, but I’m assuming we’ll make one of them work. They’ve still got about a week’s worth left on the bale they were working on in the orchard paddock, so we just left the gate open between the two. We’ll let them finish that one, then feed the next one in closer, however we decide to get it in. But it’s a huge thing off my mind to have them sorted for winter. There’s a sleet and snow storm due tomorrow, so we got it done just in time! This entry was posted in Cow, Fencing, Sheep. Bookmark the permalink. Post a comment or leave a trackback: Trackback URL. i love how all the turkeys are looking at the camera.